Using code export to save a local version of your Brandcast website. You can use the Code Export feature to save the current version of your website to your computer. This ability is limited to paid editions of Brandcast. 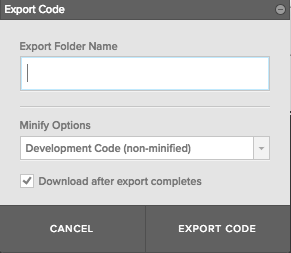 To export your site, open the "File" menu and select "Export Code..."
Give your export a name, and click "Export Code". It may take a minute or two for the file process, then your site will be automatically be downloaded to your local drive as a .zip archive. Each time you export a site, it will be added to the Export History window. This window opens automatically when you initiate an export, and it's always available from the "File" menu. Previous exports of a site can be re-dowloaded by clicking the small download icon next to their name. Your site can be exported in two formats: "Development code" (non-minified), or "Production Code" (minified). Development code is human-readable: it will be clearly formatted for you to scan, read, and edit it if you want to. Minified code will strip out anything non-essential for a browser to render the site. This code is more efficient and lightweight, and the file size will be smaller. However, it's not designed for humans to be able to parse it: this is a format that's optimized for web browsers, who aren't concerned about the readability of the code. Code export will not preserve your site hierarchy. You'll have just a single, flat directory of all the pages in your site. Raw assets (images and videos) will not be included with the export. Your pages will contain URLs that point to the location of all your images where they are being hosted on our web servers.